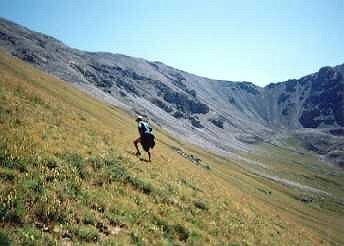 Missouri Mountain (14,067 ft, summit #5), is an interesting challenge because of the many descent routes. 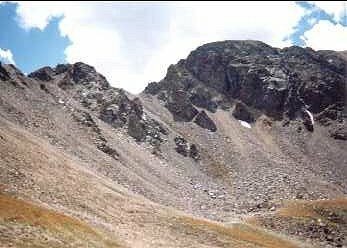 The most direct is the class 4 east ridge to Elkhead Pass at 13,200 ft, which nobody used. 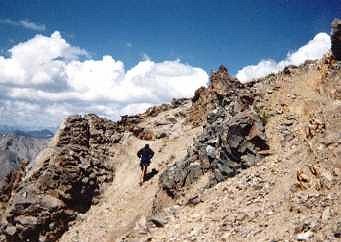 Instead, everyone used one of the steep scree descents from the northwest ridge into Missouri Gulch at 12,600 ft., where Betsy Kapiloff had hiked in a remote aid station from the trailhead at 9640 ft. Blake Wood summitted at 2:55 AM, Eric and I at 12:20 PM on day 2 in good weather. 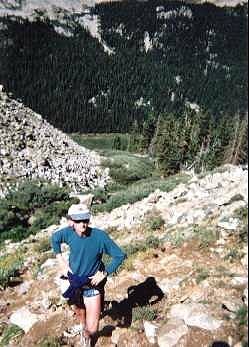 Eric Robinson climbing the steep trail up Missouri's west side. Sucking wind at 13,000 ft., where there is 40% less of it. 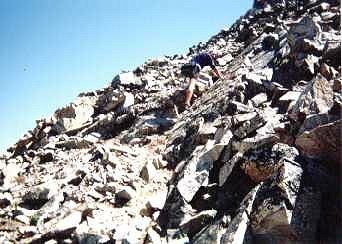 Approaching the summit via. 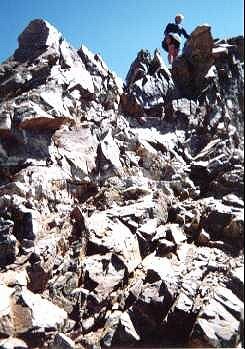 the northeast ridge. 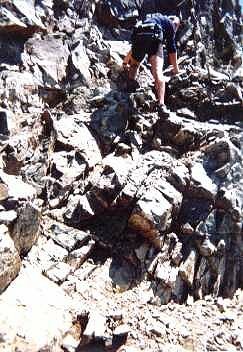 Climbing a rock outcropping on the northeast ridge near the summit. 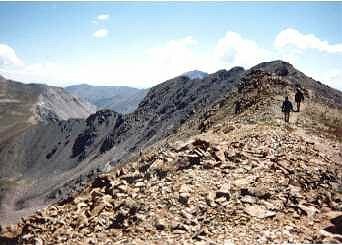 On top of the outcropping. 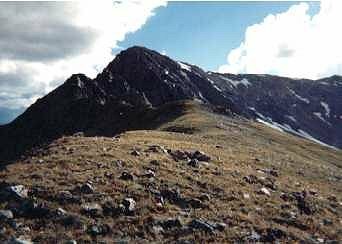 Missouri's class 4 east ridge, the most direct route to Elkhead Pass and Mt. Belford, but also the most difficult. 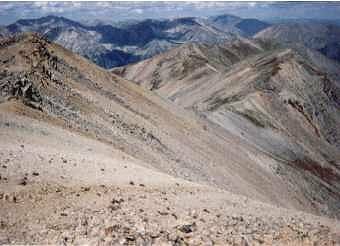 On July 1, I attempted to skirt the south side of the class 4 ridge to Elkhead Pass, only to end up at a 100 ft. vertical drop. 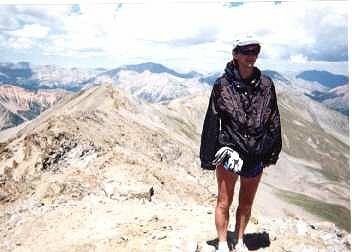 I was forced to descend the very steep slopes to Missouri Basin to the south at 12,600 ft. 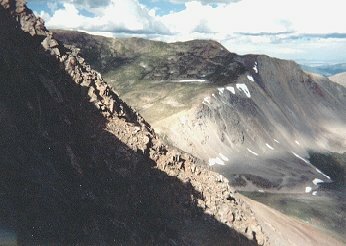 The northwest ridge, with a choice of scree descents to the right. This is the route we actually took. Missouri from Elkhead Pass along the class 4 ridge.